Lol, yep, I have it!! now that's a good one!! i am not a reader as i have memory issues but most of my friends are readers and they would love this!!! Thanks for the new word I am learning today and also for helping in the pronunciation too! 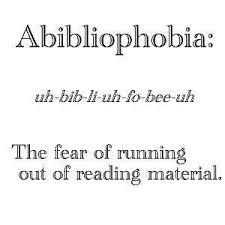 I think I used to have this phobia but now my reading has slow down and I still have many books I have not read. I have it! It is would be worse than running out of vodka!